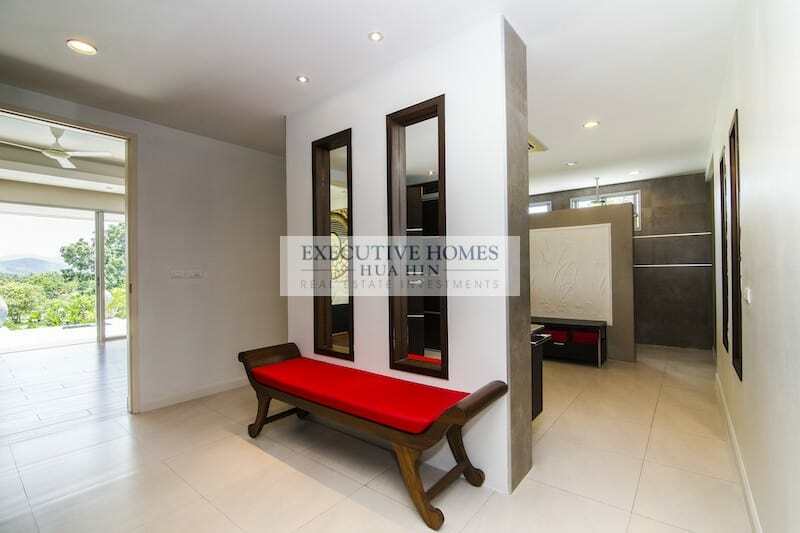 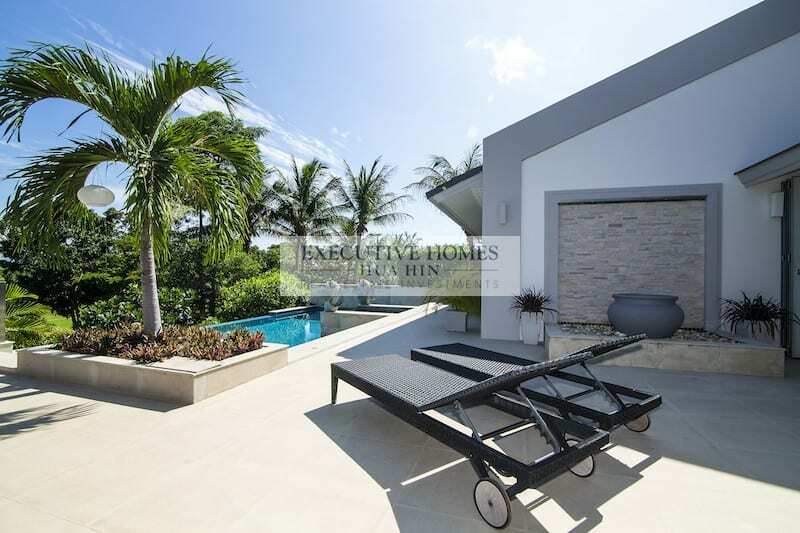 This home was designed by the most prestigious architect in the Hua Hin area, and the design is super sleek and modern, yet also practical and comfortable. 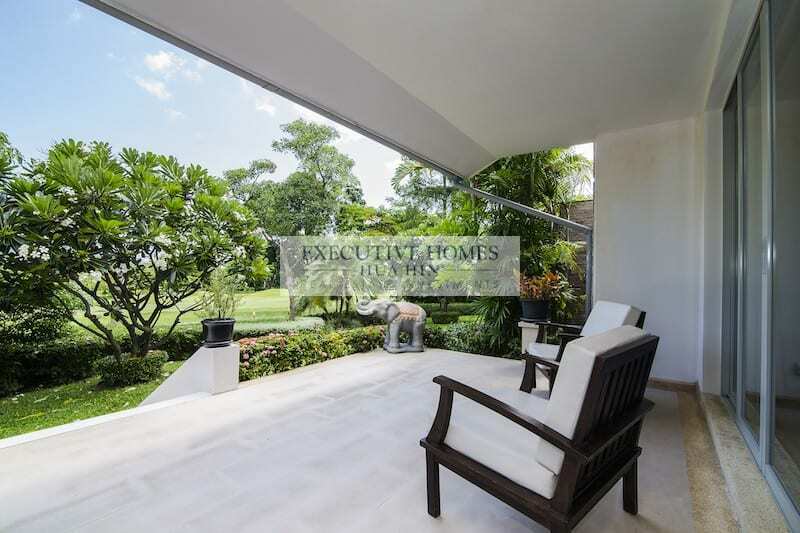 Upon entering, one is impressed by the expansive, open feeling thanks to the very high ceilings and floor-to-ceiling sliding glass doors that span the entire length of the wall and lead onto the large covered terrace and swimming pool. 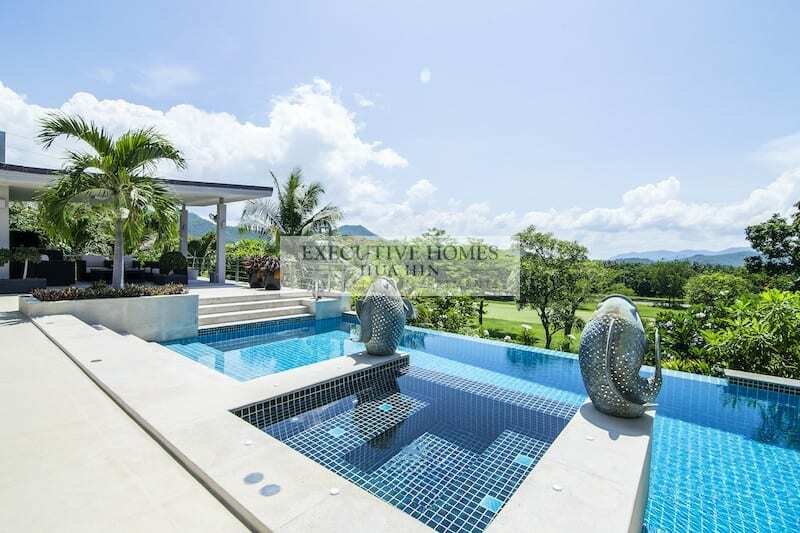 From this vantage point, one can enjoy the lush, manicured views of the 17th hole and the mountains beyond, which are especially beautiful at sunset. 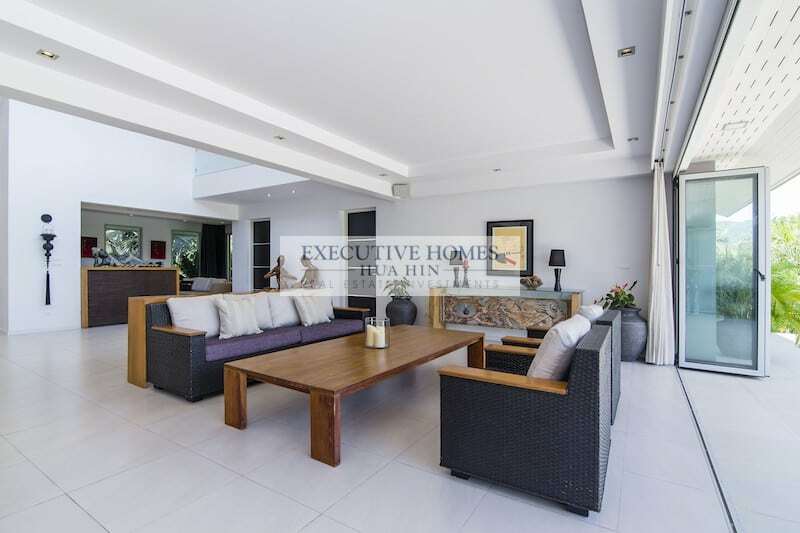 The main floor of the house comprises the large living area, the cozy media room, the modern kitchen, and the master wing. 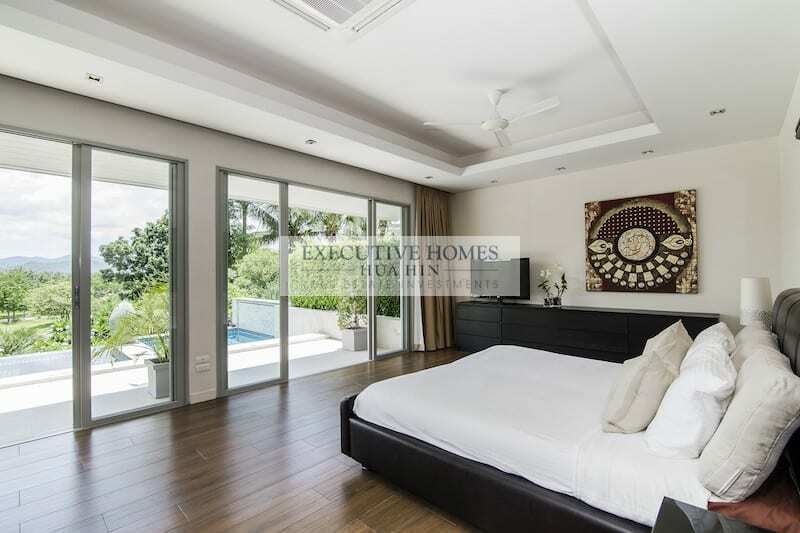 The smart design of the master suite allows the master bedroom to enjoy the great views overlooking the swimming pool, garden and golf course beyond. 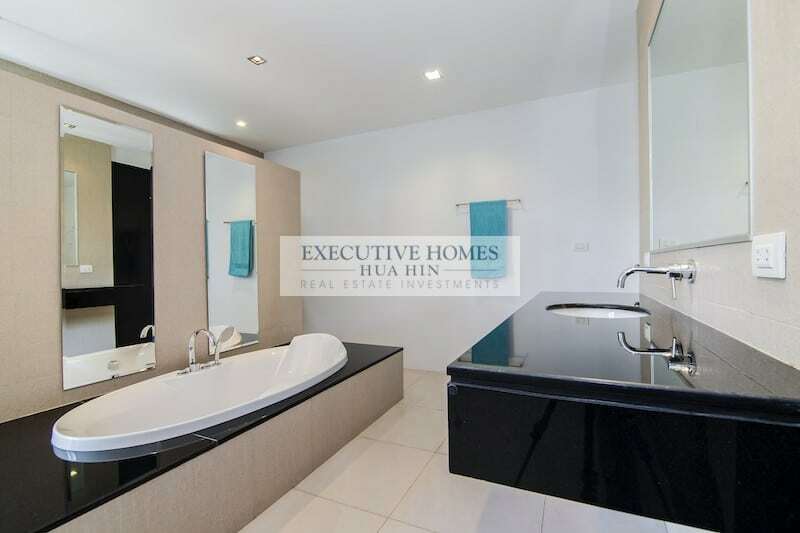 The master bathroom features double sinks and a large rain shower. 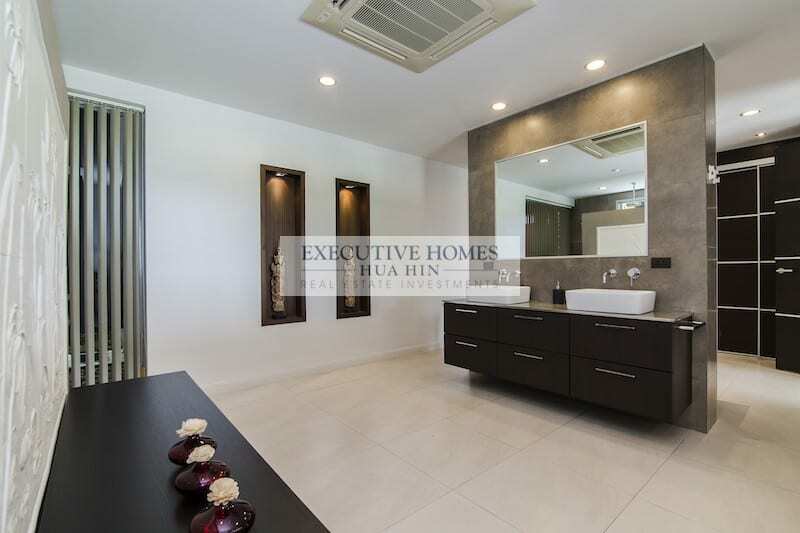 The color palette is dark and neutral, which enhances the modern, sleek design. 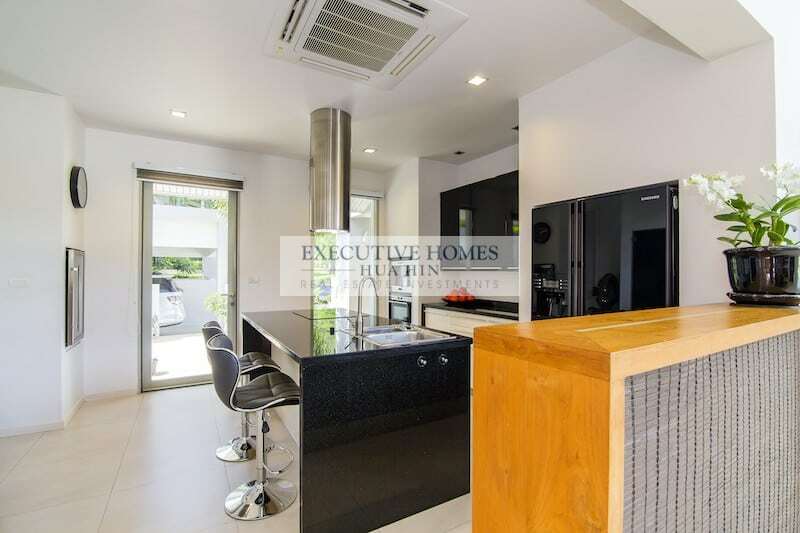 The kitchen has all the necessary, high quality appliances one would expect in a luxury home. 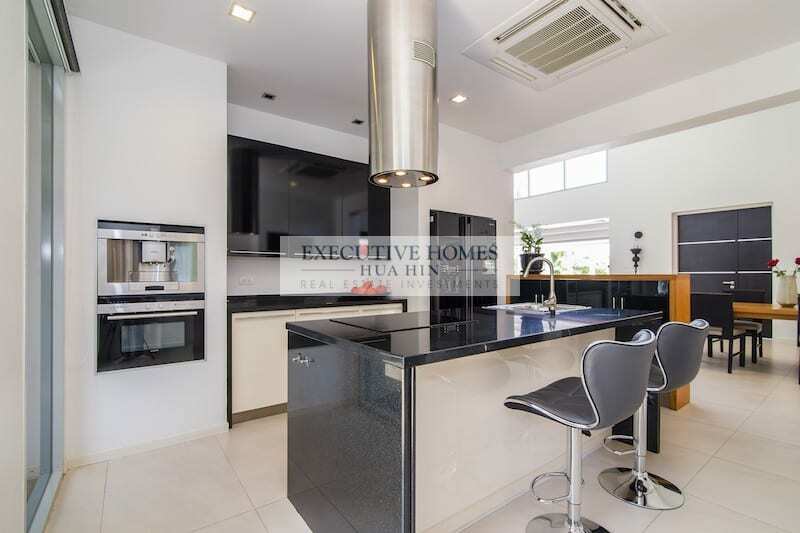 There are high gloss cabinets, black granite counter tops (with a waterfall feature on the island/breakfast bar) and plenty of storage space throughout. 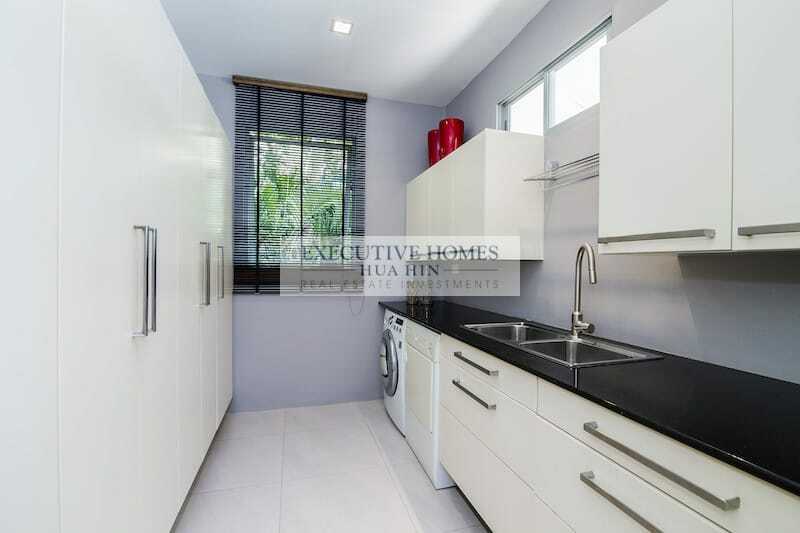 Additionally, a large Thai style kitchen and laundry room are attached directly to the “show kitchen” for practicality and smart design. 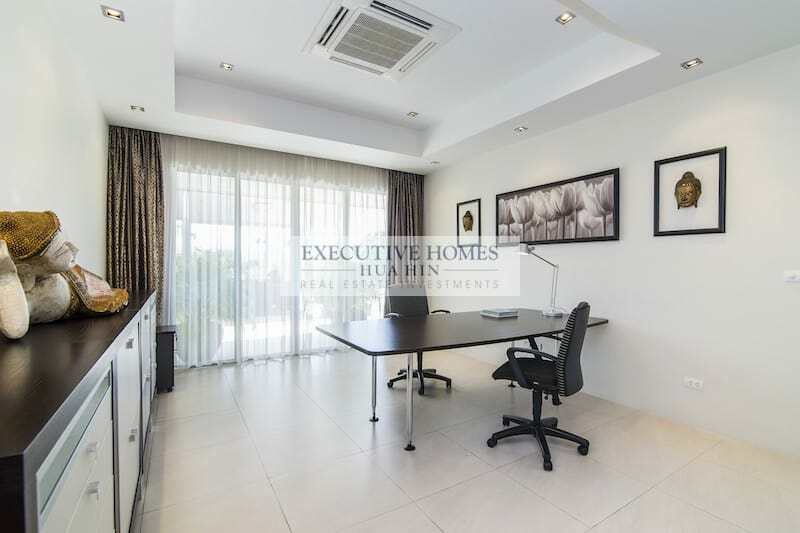 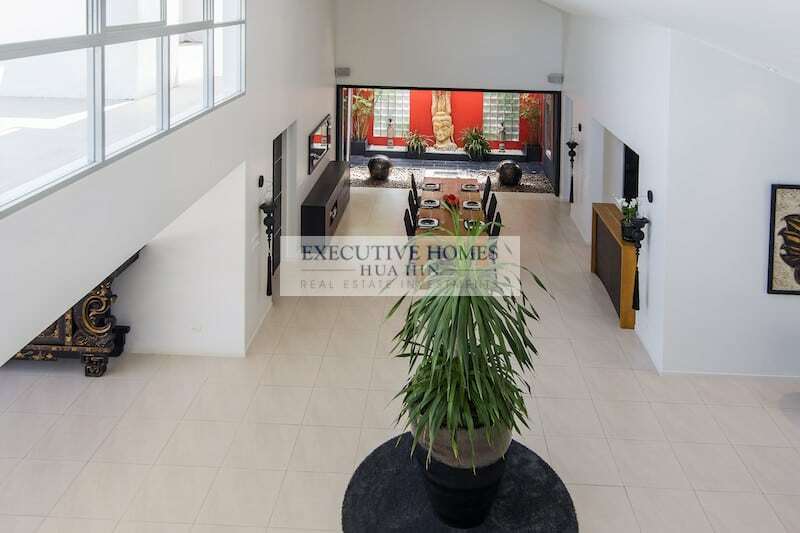 Also on the main floor is a large office area with direct access to the terrace. 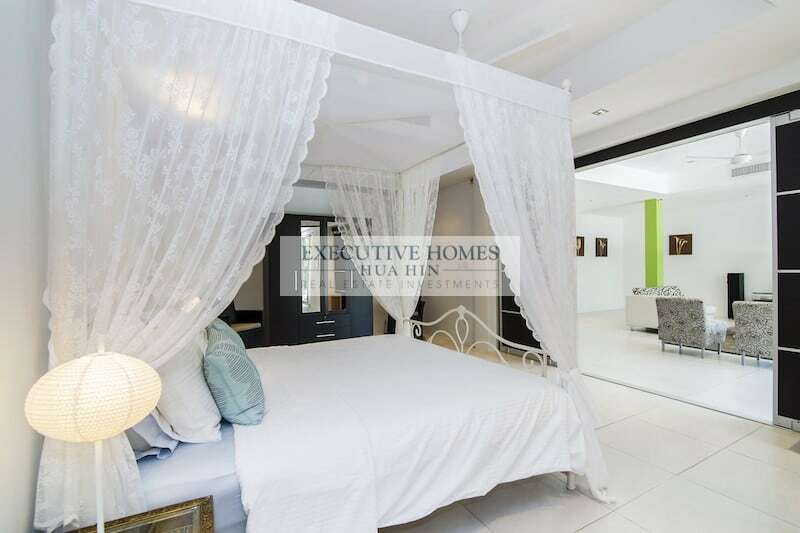 This room could also be utilized as another bedroom, a fitness room or other purpose. 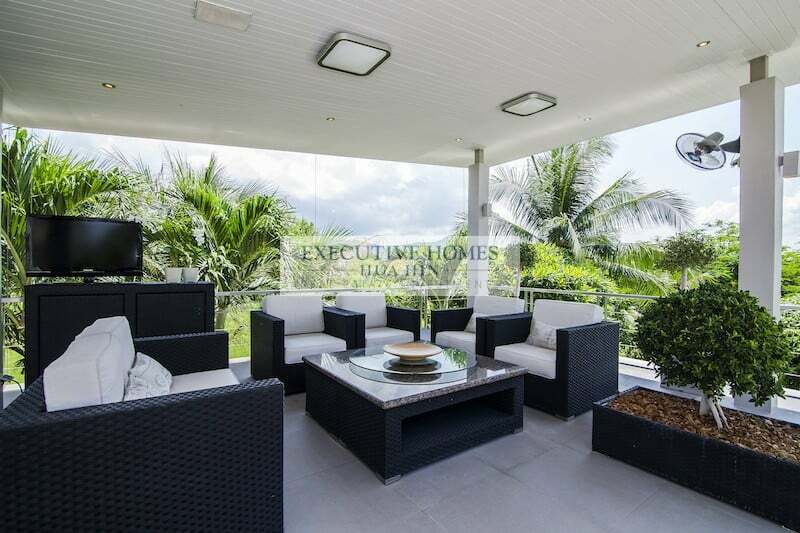 One of the highlights of the home is the spacious outdoor terrace with covered seating areas for both dining and lounging, a perfect spot for entertaining guests and enjoying the tropical outdoor lifestyle. 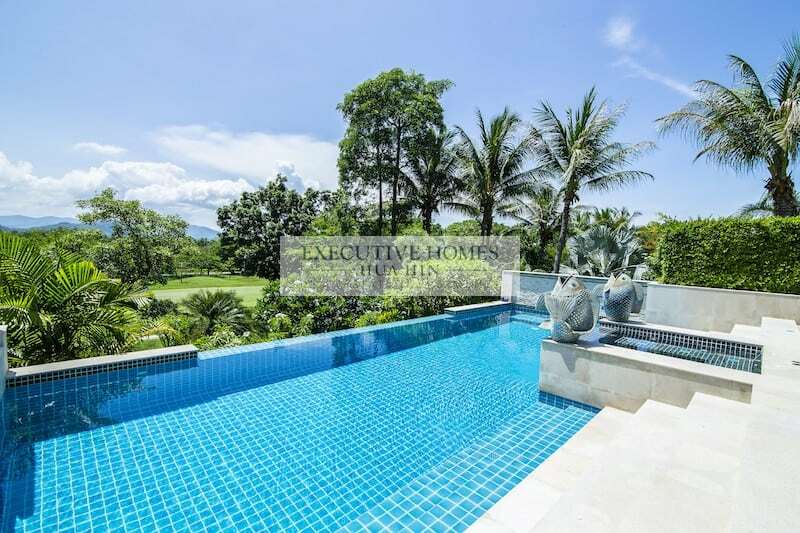 The lovely swimming pool with jacuzzi is an architectural feat, giving the impression that it is floating above the gardens and the golf course. 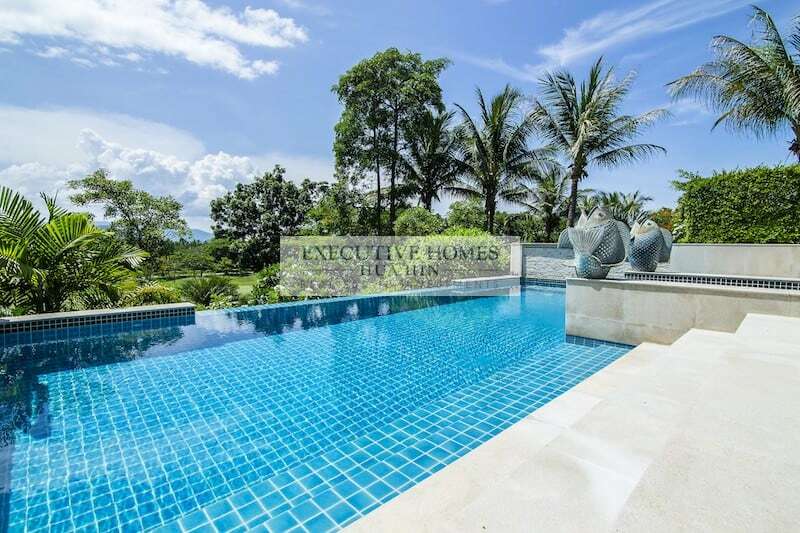 With the large sculptures, wide staircases and waterfall feature, this is a truly impressive swimming pool. 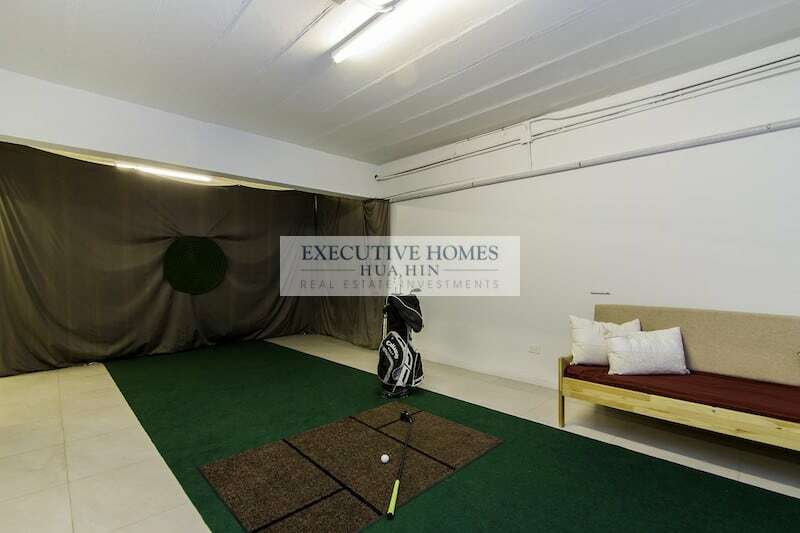 The downstairs portion of the home is quite spacious with 4 more bedrooms, all en-suite, plus a golf driving range, a storage room, and a media room. 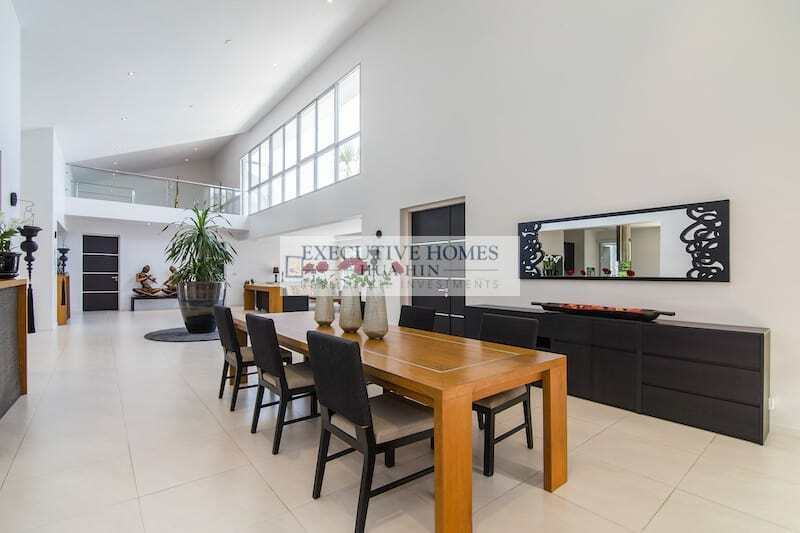 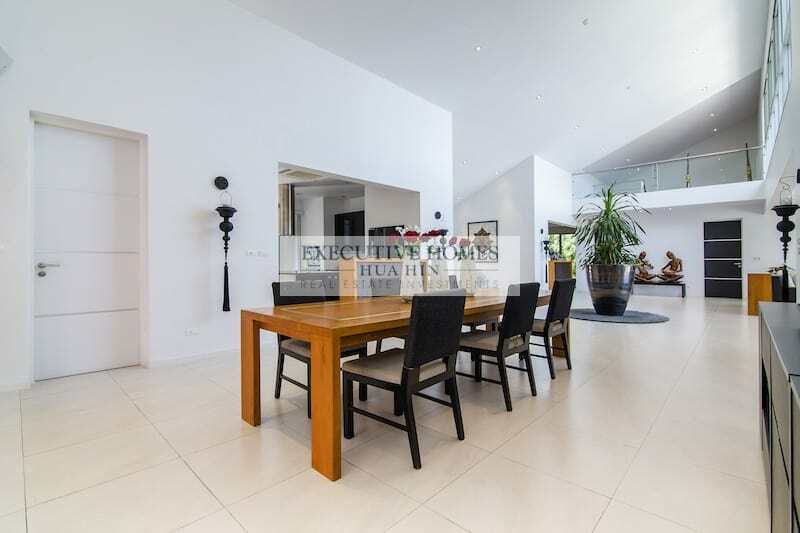 This is the perfect area for extended family, especially children, as the space is perfect for a giant play room. 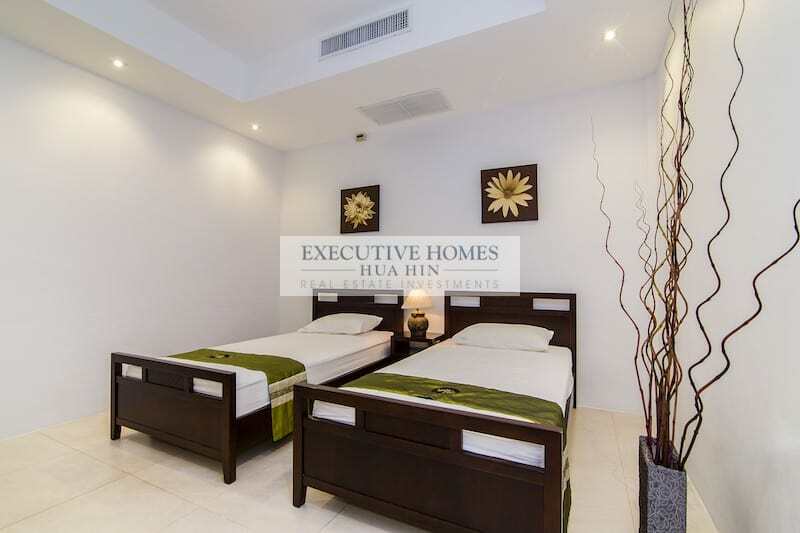 There is also a room that could be used for a live-in maid and caretaker; plus an additional exterior bathroom and storage area specifically for workers. 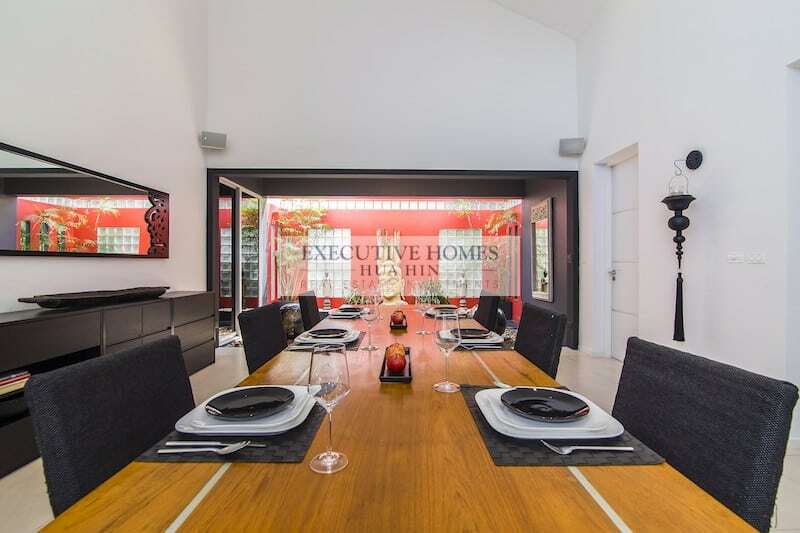 The design of this home has taken absolutely every detail into account, and the execution is perfect. 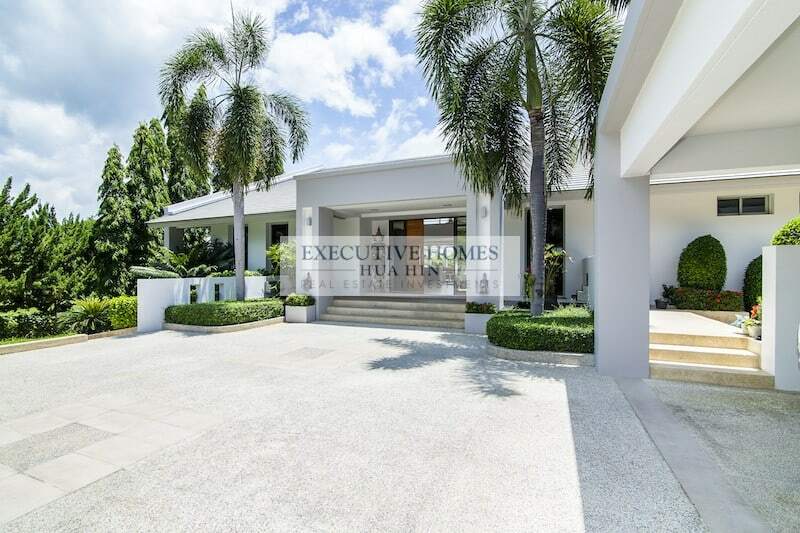 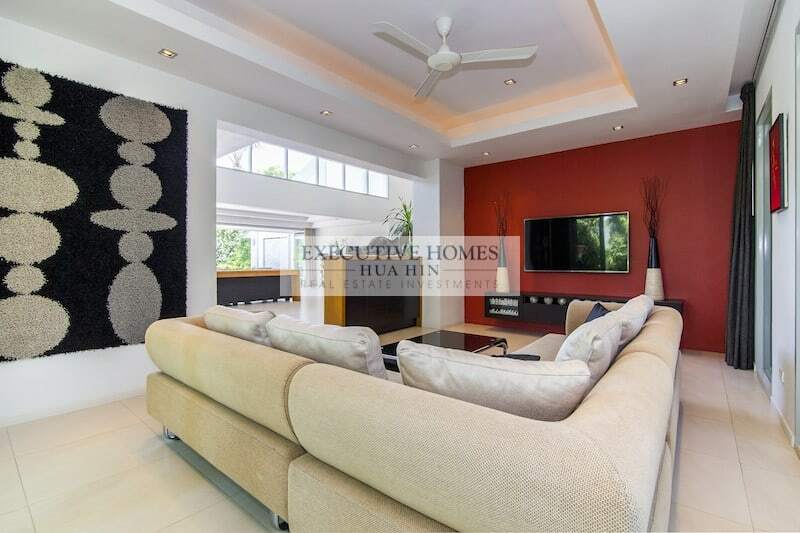 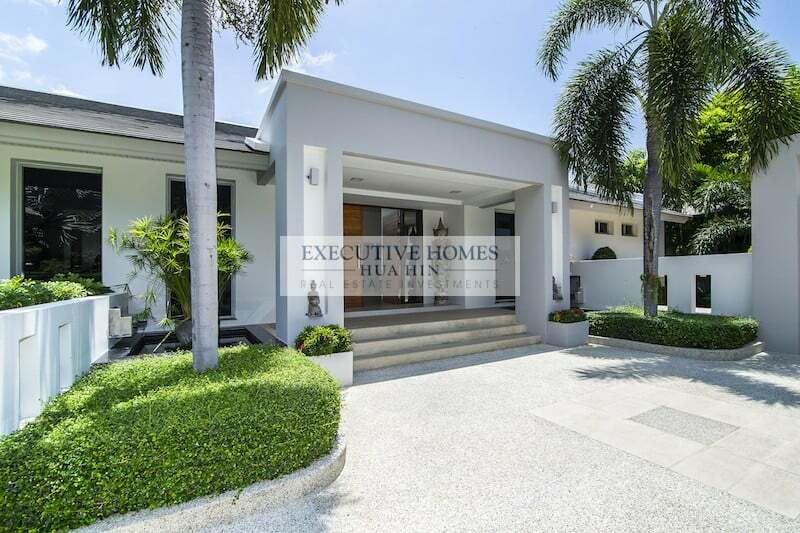 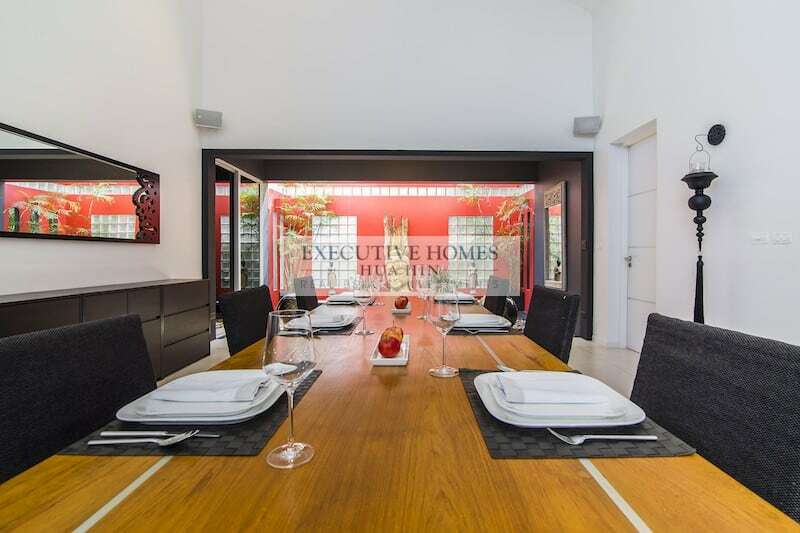 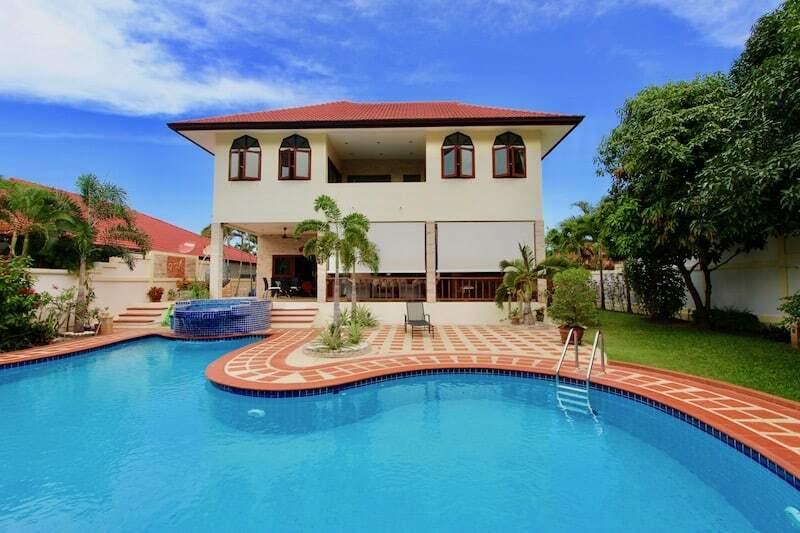 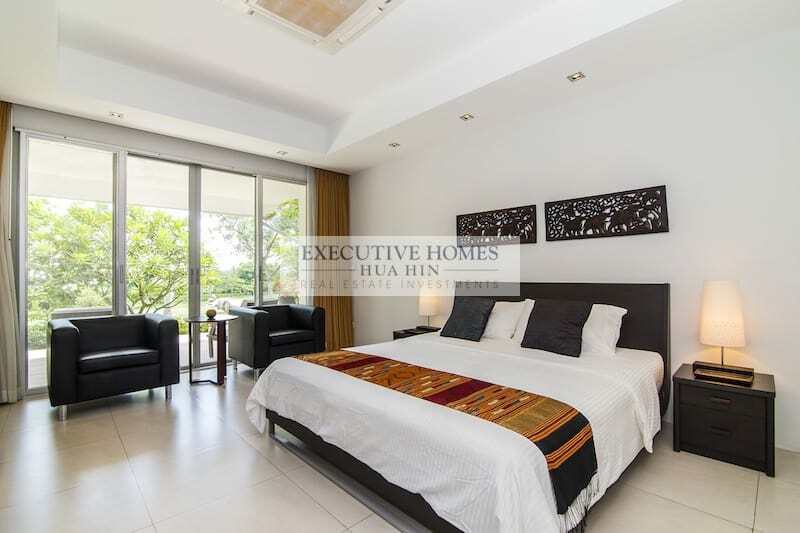 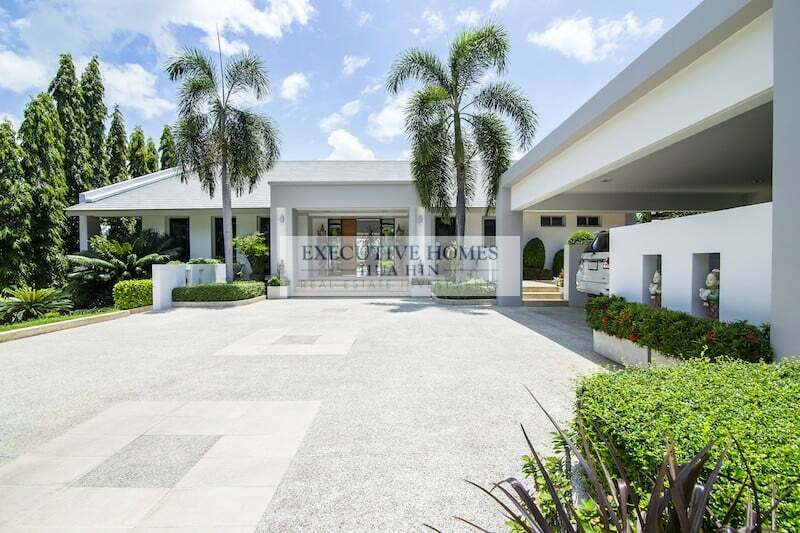 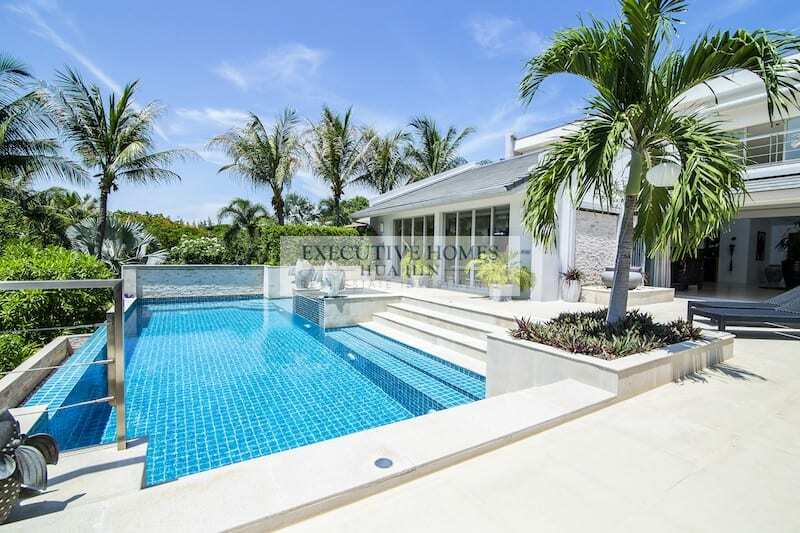 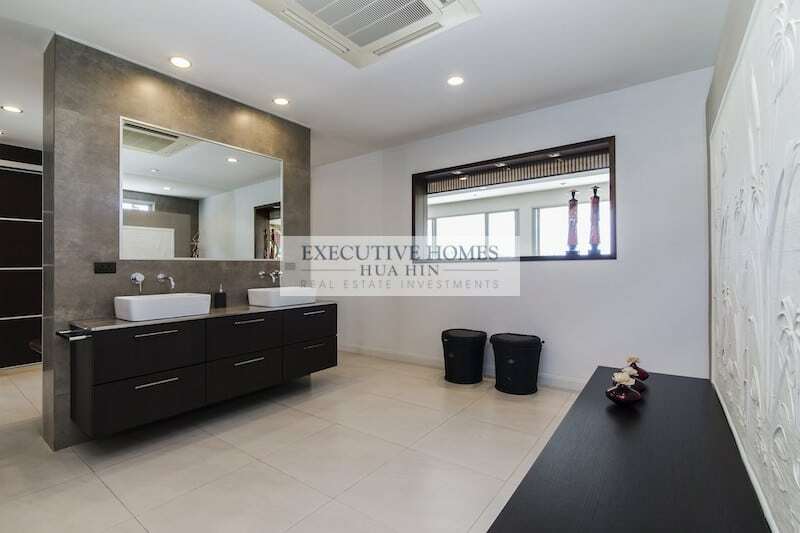 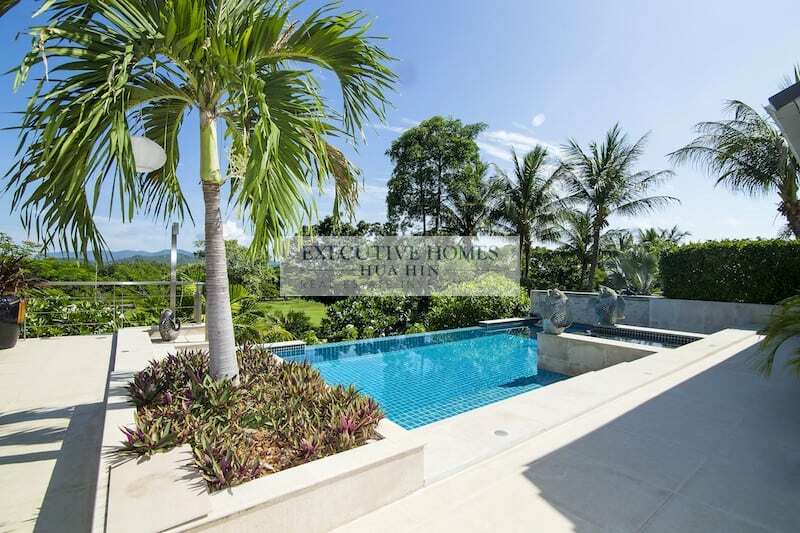 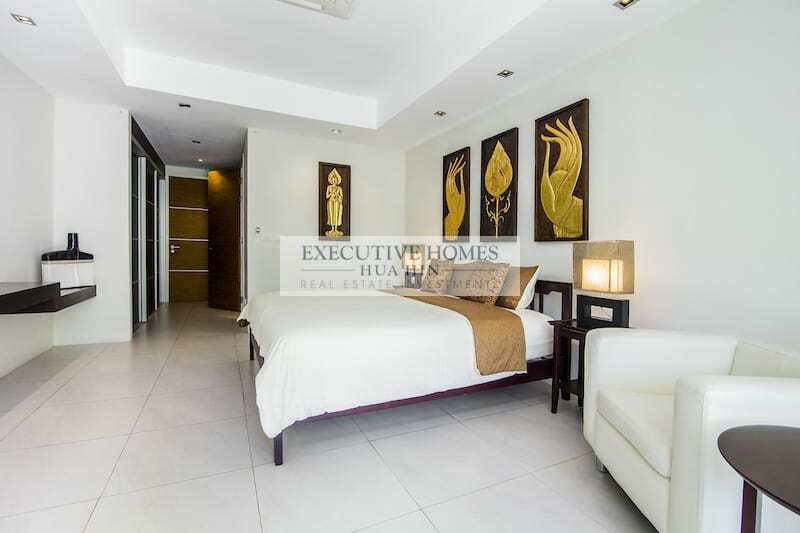 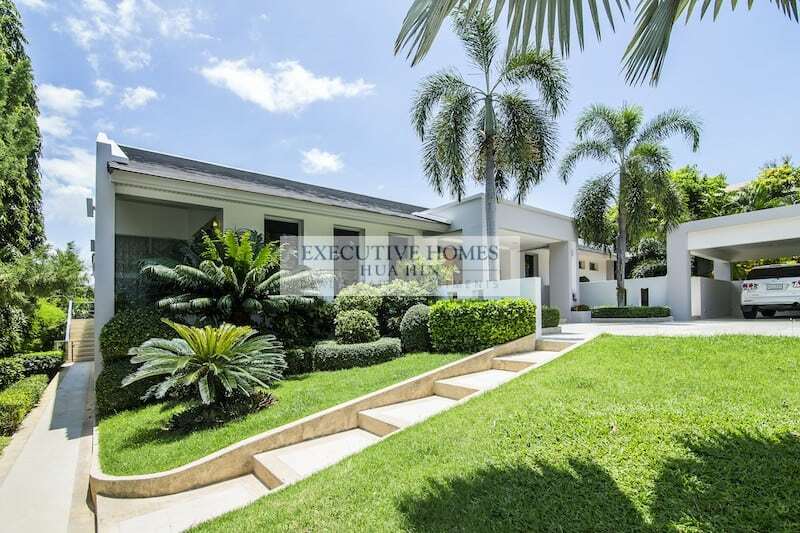 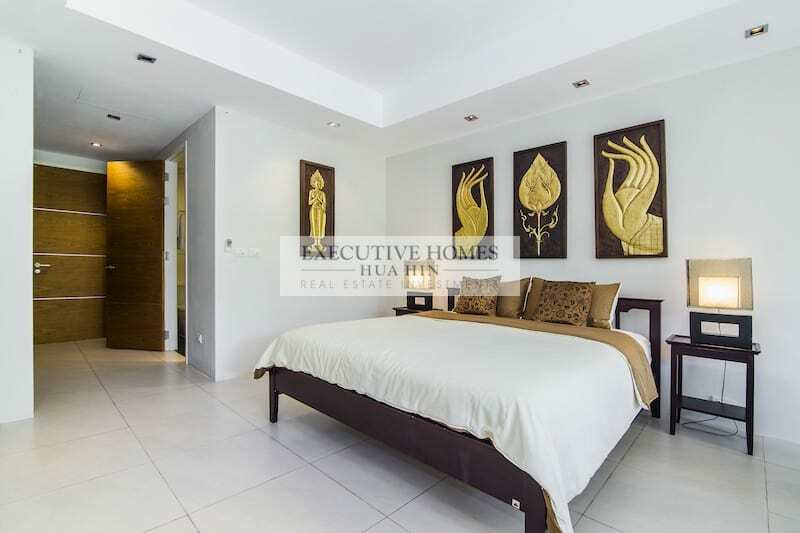 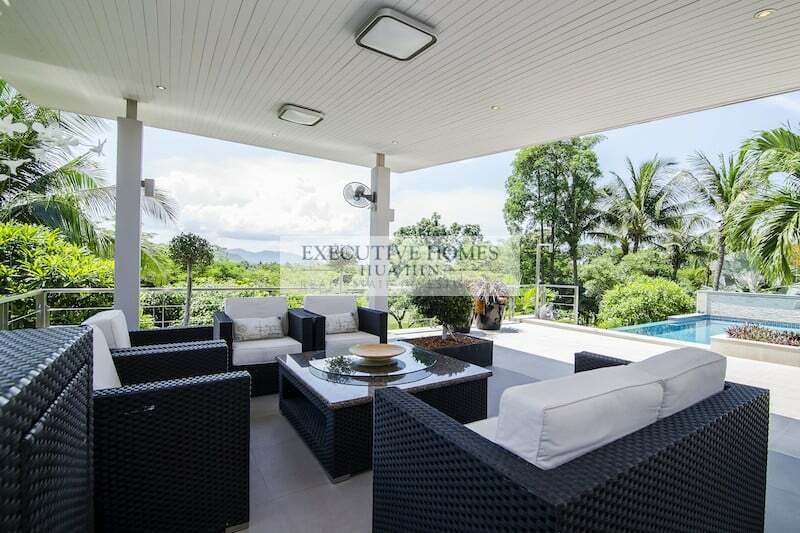 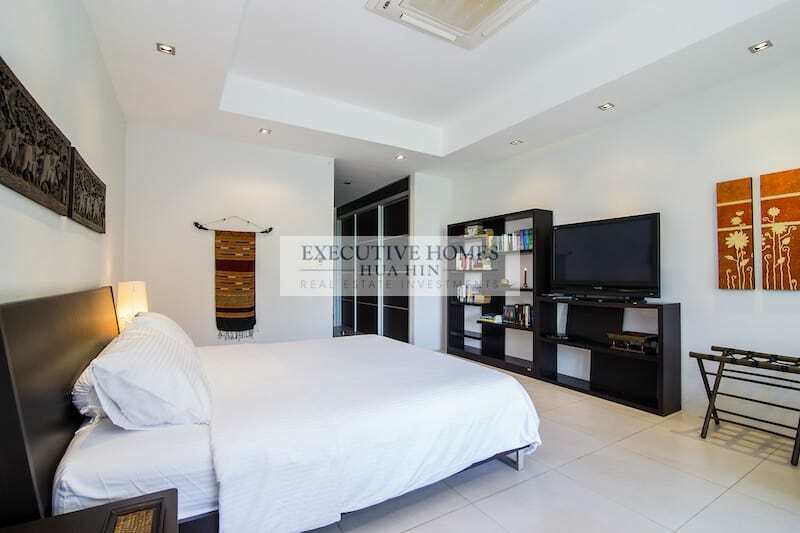 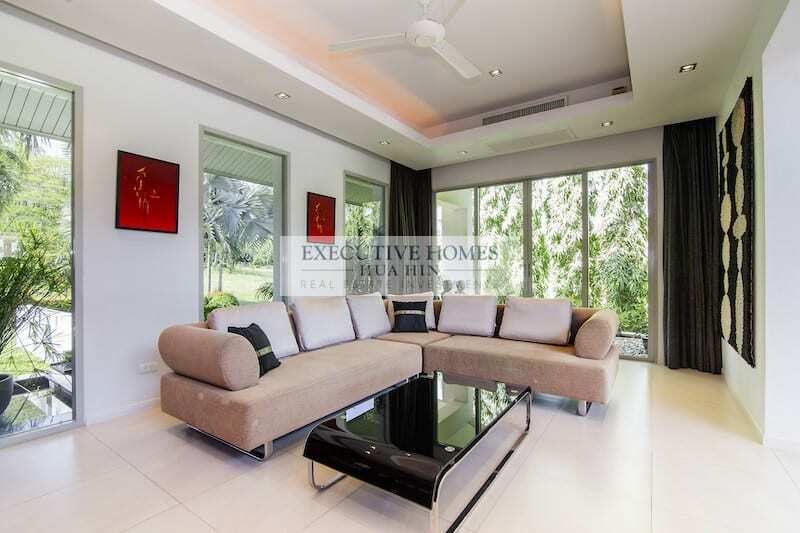 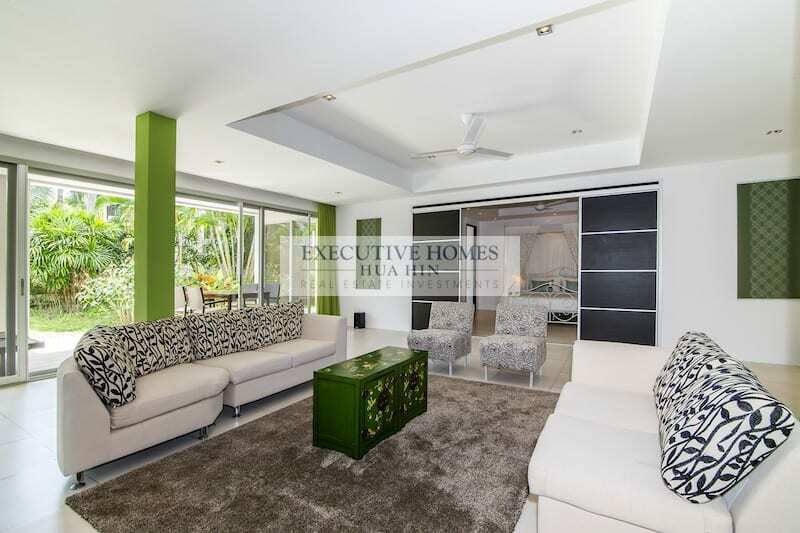 For more information and to schedule a viewing of this stunning Palm Hills mansion for sale, please contact Executive Homes Hua Hin at +66(0)85.264.2158.